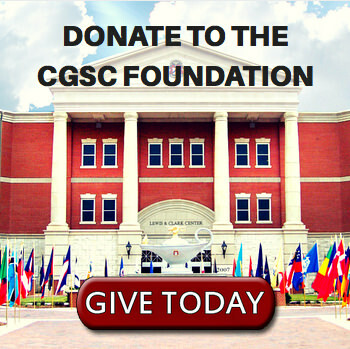 CGSC Graduation Awards | Command and General Staff College Foundation, Inc. The General Douglas MacArthur Military Leadership Writing Award was established in 1985 to encourage and recognize scholarship and professional writing on leadership. The Douglas MacArthur Foundation in Norfolk, Va., sponsors this award and the Center for Army Leadership administers it. The General John J. Pershing Award recognizes the top graduate in each CGSOC Distance Learning class. The Excellence in Joint Command, Control, Communications, Computers and Intelligence (JC4I) Writing Award recognizes the student who excels in research and writing on the subjects of JC4I. This competition is open to both CGSOC and School of Advanced Military Studies students. The Kansas City Chapter of Armed Forces Communications Electronics Association awards a plaque for the best essay at graduation. The Iron Major Award was established in 2005 to recognize exceptional physical fitness. The award is presented to the U.S. and international students who finish first in a grueling series of events designed to test endurance and strength. The Iron Major Award is an M7 bayonet mounted on a plaque and is presented by the CGSC commandant. The Arter-Darby Military History Writing Award, established in 1980, enhances professional scholarship by research and writing about the evolution of American tactical doctrine. Retired Lt. Gen. Robert Arter, a former deputy commandant, and former U.S. Sen. Harry Darby of Kansas City endow this award. 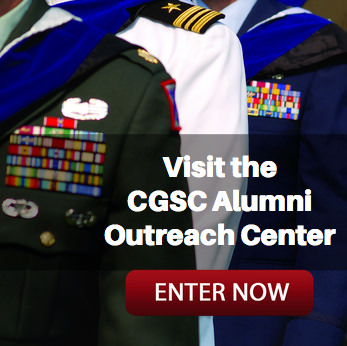 This award for military scholarship is open to all CGSOC students. Interested students write a well-documented, historical master of military arts and science thesis or a thesis-length monograph for submission to an editorial board. The Arter-Doniphan Award honors an American soldier and statesman whose life exemplifies the highest qualities of a member of the profession of arms. Col. Alexander W. Doniphan’s long and distinguished service in the Missouri militia included his heroic leadership in the Mexican-American War where he successfully campaigned his regiment more than 5,000 miles against forces far superior in numbers. The Arter-Doniphan award is presented to the member of the class who has earned the highest overall grade point average for the year and is sponsored by the Alexander Doniphan Committee. The Father Donald Smythe Military History Award was created in 1989 to present to the best military history student. Candidates write a thesis-length paper on a historical topic and take at least two Combat Studies Institute electives. Selection is based on course performance, recommendations and the quality of the written work. This award, by recognizing excellence in the study of history, honors the memory of an esteemed scholar, Father Donald W. Smythe, who served as the John F. Morrison Professor of History from 1985-86. The Excellence in Joint Service Warfare Award is presented to the student who contributes the most significantly to the study, implementation and spirit of joint service warfare. Additionally, the student must demonstrate proficiency in joint core courses, Joint Advanced Warfare Studies, attainment of an additional skill identifier in joint service warfare, participation in joint special operations areas of concentration, joint service warfare electives, publication of joint service warfare articles and completion of a master of military arts and science degree with a focus on joint service warfare or a comparable degree from another institution. The award is open to all members of the regular class. The award is endowed by the Military Officers Association of America.